Premium Quality 4mm Banana Plugs Gold Plated Speaker Cable Connectors Gold plated 4mm screw type banana plugs for speaker cable. 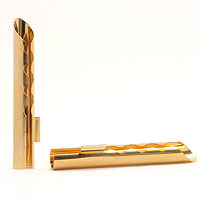 These premium quality connectors have twin fixing screws and a stylish nickel plated handle. Item code: BANPLU05. 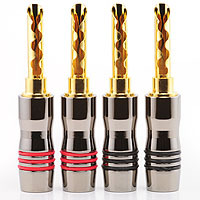 Stackable 4mm Banana Plugs - Heavy Duty Gold Plated Speaker Cable Connectors 4mm Banana connector with thumb screw design for quick and easy fitting. The internal piston prevents shredding of speaker cable strands, while the 4mm rear connection allows them to be stacked together. Side cable entry with rotating pin. Item code: BANPLU04. 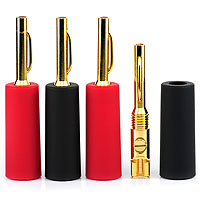 Solder & Screw 4mm Banana Plugs - Professional Quality Gold Plated Speaker Cable Connectors High quality 4mm banana plug speaker cable connectors. The generous solder bucket and quality brass screw creates a permanent cable termination. This type of connector is favoured by enthusiasts and professionals. Item code: BANPLU03. 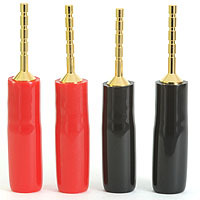 Screw Fit Speaker Pins - Gold Plated 2mm Banana Plug Connectors Versatile speaker cable pins which can be used to connect speaker wire to spring clip push terminals or binding posts. 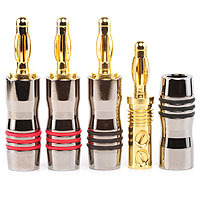 These quality 2mm banana plugs have a screw terminal and gold plated finish. Item code: PINCON01. Premium Quality BFA Banana Plug Speaker Cable Connectors Premium quality 4mm BFA plugs for speaker cable. The gold plated body has twin screw fixings and the solid brass handles have a polished nickel plated finish. Item code: BFAPLU04. Screw Type BFA Plugs - Gold Plated 4mm Hollow Z-Banana Connectors High quality BFA banana speaker plugs with a gold plated finish. The low mass hollow pin will connect to standard 4mm binding posts, as well as BFA type terminals found on amplifiers by Arcam, Linn and Cyrus. 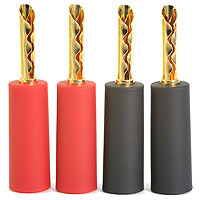 Supplied with high grip screw on covers. Item code: BFAPLU02. 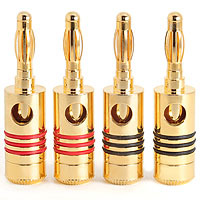 Solder Type BFA Plugs - Gold Plated Hollow Banana Connectors A gold plated phosphor bronze hollow BFA banana plug with solder bucket. This low mass 4mm speaker cable connector is often favoured by professional speaker cable suppliers, as it has less effect on the impedance of the cable. Item code: BFAPLU01.